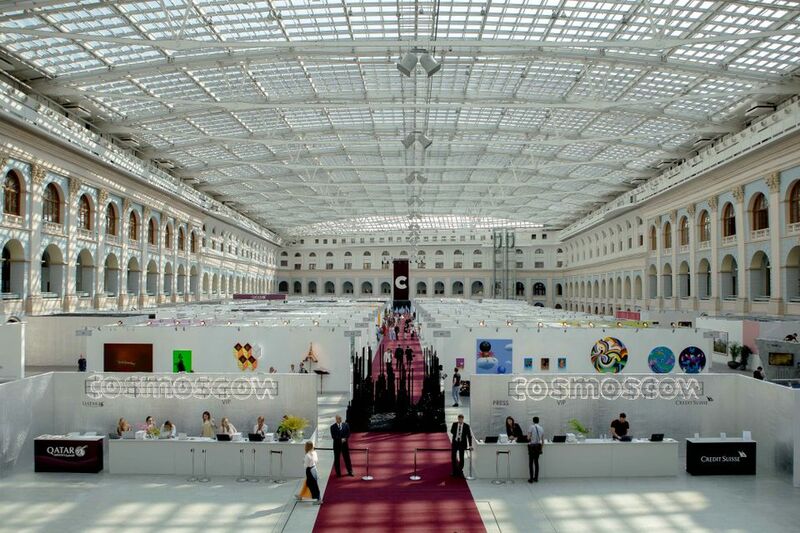 The Cosmoscow International Contemporary Art Fair opened yesterday, 6 September (until 9 September), with Qatar Airways as its new general partner and, at its centre, a stand containing the a Qatari contemporary art exhibition in Russia titled What We Are Made Of. 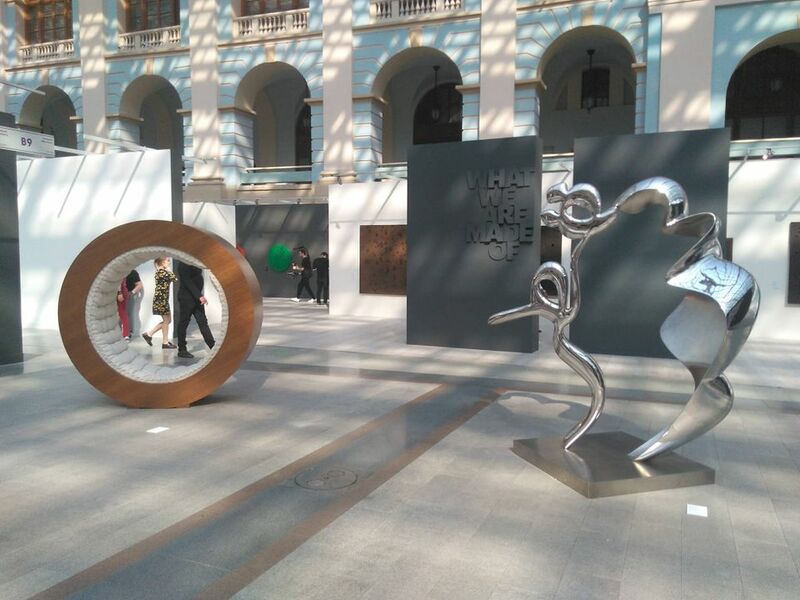 Now in its sixth edition, Moscow’s only contemporary art fair has expanded to seven sections with 70 galleries, ranging from Paris’s 55 Bellechasse to H.L.A.M. from Voronezh, a southern Russian city near Ukraine that is known for its contemporary art scene. Credit Suisse remains as a strategic partner and funds a prize presented at Cosmoscow to support young artists. At Cosmoscow's press view yesterday, Pushkina told The Art Newspaper that further plans are still taking shape and specifics cannot yet be revealed, but, she said, “I really hope that there will be opportunity to show Russian artists [in Qatar] as well”. She added that collectors from both regions are open to new art. Cosmoscow organised a tour of Russian collectors to Art Dubai this year, she said, and the Moscow fair is expecting Qatari collectors. A sleek Qatar Airways lounge at the fair was cordoned off by velvet rope from the general public. Art Dubai is, of course, in the UAE, which has had tense relations with Qatar over the past year, underscoring the geopolitical element that plays into cultural ties. Russia continues to be hit by sanctions over its actions in Ukraine and the Novichok nerve gas poisoning of Sergei Skripal, a former Russian spy and his daughter in Salisbury, England. Perhaps seeing crisis related belt-tightening as an opportunity, Cosmoscow has been promoting less expensive art to bring in younger, less wealthy Russian collectors. Qatar Airways was also a sponsor of the 2018 FIFA World Cup, held this summer in Russia, and has three daily flights to Moscow and launched a daily flight to St. Petersburg in 2017. Qatar will be hosting the 2022 World Cup and like Russia wants to capitalise on good will from that event. Cosmoscow is held at Gostiny Dvor, a vast pre-revolutionary pavilion near the Kremlin that has been used for President Vladimir Putin’s political events and during the World Cup served as the Mexico fan house. Reem Fadda, the Palestinian curator of What We Are Made Of, said at Cosmoscow’s opening press conference that her goal was “revealing the commonalities between the two countries,” the “idea of openness” and views about the representation of tradition and culture that is characteristic of both Qatari and Russian culture and the challenges they face due to “growth and development” and the “rise of consumerism." The exhibition includes works that address issues of feminism and femininity, such as Amal Al-Aathem’s Qatar Motherland I, a stainless steel sculpture, Mohammed Al Atiq, a male artist whose works use women’s hairpins, and Hana Al-Saadi, who created an installation out of concrete blocks, while wearing the hijab. It even includes “a comment on the current political state of affairs in the Gulf region,” Fadda said. Faraj Daham’s “Spring Flower” series reflects on the Arab Spring. The works were provided by Al Markhiya and Anima galleries in Doha.